Each Advancing Leadership (AL) and Advancing Leadership Youth (ALY) class completes a team project during their program year. The team project accomplishes several goals. As a hands-on learning lab, it requires the class to utilize everything they have learned about leadership, teamwork and their community to reach a shared goal. As a part of their program, it provides an opportunity for them to experience success as a group of diverse leaders. Most importantly, their project addresses an identified need and has a lasting impact on the community. 2006: Installation of a large public mural depicting the Federal Way community, in partnership with Americorps, on the back of the Poverty Bay Coffee Cafe. 2008: Roots to Wings, a mentoring program matching senior citizens and elementary school students, founded in partnership with the Federal Way Senior Center and Federal Way Communities In Schools (CIS). 2010: Unite FW website is an online hub of information on local resources and programs designed to deter gang activity and provide education and options for local youth and the adults who care about them. 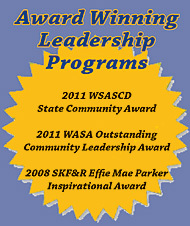 2011: Recruited over 45 new mentors for Federal Way Communities In Schools PASS mentor program. 2012: Founded Real World Federal Way, a job-shadowing program for students at Federal Way High School; the program connects teens with local businesses and encourages them to finish school and plan their career paths. 2013: Organized Break The Chains 5K Event, recruiting 200+ participants to walk, bike and scooter to raise awareness and funds to fight human trafficking in our city. $12,000 was raised and donated to Federal Way Coalition Against Trafficking (FWCAT). 2014 – Assisted the Federal Way Community Gardens by: providing a comprehensive business and marketing plan to their board of directors; held a “Day of Organics and Gardening” fundraising event which raised $13,000 for the foundation; and held a one-day gardening day-camp for elementary students in the Federal Way School District. 2015 – Supported the Federal Way Community Caregiving Network by: Assisting with improving processes for their annual fundraiser event, and provided them with a Resource Guide and updated business plan. 2016 – Partnered with South King Fire and Rescue to create “Save A Life Saturday”, where hundreds of local residents learned CPR – in several different languages. 2005: Presented skits on peer pressure, academic success and making good choices to fifth graders at Lake Grove Elementary School. 2006: Held an assembly for eighth graders at Lakota Middle School on successfully navigating high school. 2007: Met with students at Sacajawea Middle School to answer their questions about the realities of high school and how to prepare. 2008: Performed skits followed by a question and answer session to students at Illahee Middle School about making the most of high school and avoiding potential pitfalls. Many students applied to ALY as a result of this presentation. 2009: Organized and facilitated Conversation Cafés at Todd Beamer and Decatur High Schools to encourage students to work together to solve social issues at school and in the community. 2010: Go Green! Spent a half-day at Rainier View Elementary School using skits and hands-on activities to teach students how to be environmentally responsible, then participated in ivy clean-up at Dash Point State Park. 2011: Founded “One Day Federal Way” as the new concept for ALY projects: spending one full day serving the needs of a specific group of people in the community. This class recruited 300 adult and youth volunteers to clean up three high-poverty schools. 2012: Organized One Day Federal Way for the Homeless, bringing out over 150 adults and teens to walk around Federal Way city center and raise $5000 for Reach Out Federal Way men’s and women’s homeless shelters. 2013: Addressed bullying in local schools with One Day Federal Way Volunteen, an event bringing in more than 200 high school students on a school holiday to sign an anti-bullying pledge and explore volunteer options in the community; the success of Volunteen was followed by an invitation to share their project and message with the entire student body of Sunnycrest Elementary School. 2014: One Day YOUR Way Dropout Prevention: Created a special “stay in school” event to mentor middle school students while sharing a meal, dancing, playing games and sharing experiences. Over 75 students from middle schools across the district rode buses in from their neighborhoods on a school holiday to eat, laugh and get to know ALY high school students. 2015: Teamed with the Federal Way Police Department to present Co Op with The Cops. Funny videos and social media spread the word to teens across the city that the cops are approachable and there to serve the public. The whole city was invited to spend a Saturday at a neutral location to play basketball, dance and compete in an “Amazing Race” event with the cops, followed by a Q&A session with the police chief and other officers. 2016: Supported the South King Tool Library by holding an awareness event, called “FYI It’s DIY” where vendors from a variety of businesses came to demonstrate how to “Do it Yourself”. A Handyman Contest was a highlight of the day, with people of all ages competing to build a birdhouse in record time. 2017: Bringing awareness to their chosen organization, “Bridging a Gap” or BAG, the class held an event called, “Bag It Up”. The goal was to create partnerships between local businesses and schools in the Federal Way School District, in order to provide food for all students over the weekends who might not otherwise have nutritious meal options at home. Highlights of the event were entertainment by local students, a raffle and several vendors who came to show their support of the BAG program.